I'm recently back from four full days in Florida, based in Ft. Myers with long-time friend and birding mentor Dori Sosensky. We had no set plans for my visit, but when a wintering female Western Spindalis was joined by a Bananaquit and La Sagra's Flycatcher over a 6-mile area near Miami, our itinerary began to take shape. 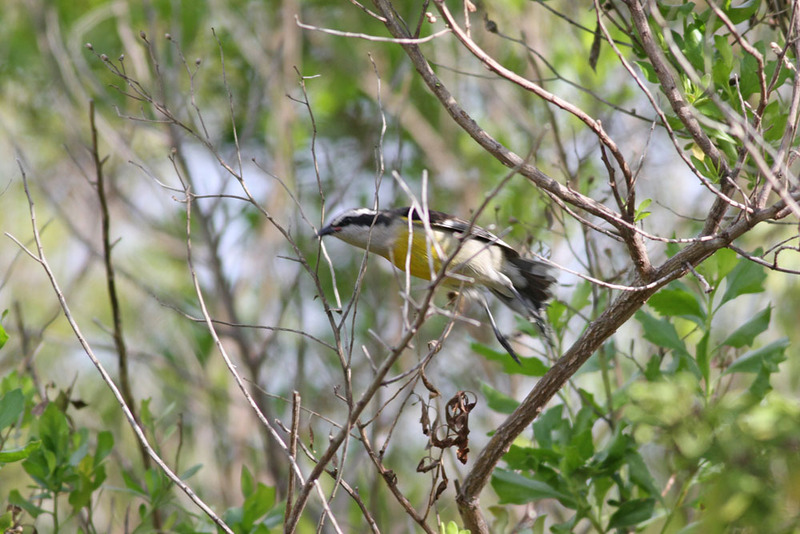 On my first day, January 8th, we would head for the Bananaquit and take it from there (apparently my fingers are incapable of typing "Bananaquit" correctly on the first try...I'm currently cursing out loud). 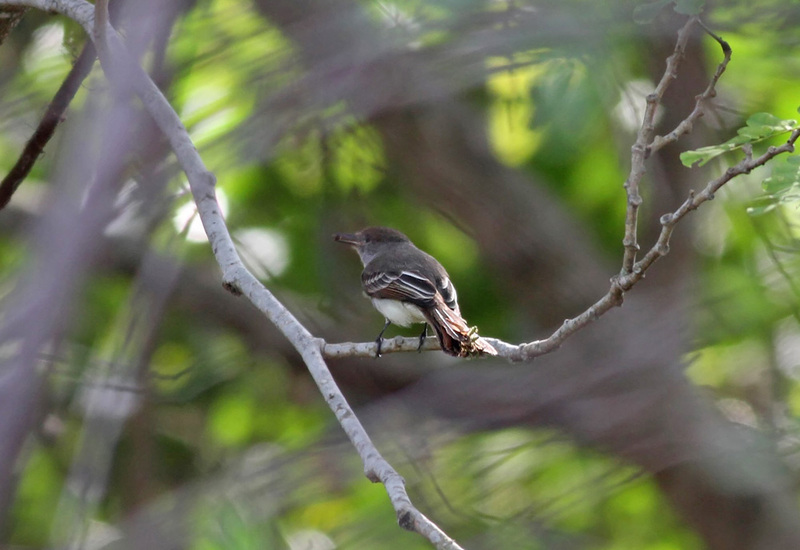 Next we headed down the road to Virginia Key for the La Sagra's Flycatcher. Lucky for us Rangel Diaz was already on the bird, eliminating what could have been a difficult search as the bird would reportedly bury itself behind dense vegetation. We watched the bird fly-catch for a few minutes before it disappeared back into the veg, but not before running off a series of its high-pitched 'wheet' call. Before noon we had seen two of the three West Indian rarities, leaving all afternoon to search for the Western Spindalis that was also on Virginia Key. Despite knowing that this bird had not been very reliable recently, my hopes were high with so much time to spare. Well, I ended up spending the rest of the day without sight nor sound of the Spindalis, with occasional help from a few other birders including its original finder, Larry Manfredi. After the unsuccessful search, Dori and I decided to head back to Ft. Myers with a possible return later in the week. Fast forward to January 11th, my last day. Eager to give the Spindalis another shot, I left Ft. Myers at 4:30am, this time insisting that Dori sleep as she has seen multiple males in FL over the years, so an unreliable female was not a high priority for her. I arrived around sunrise and immediately went to the area where most sightings have occurred, but no bird. I was going to give it until 11am before heading back to Ft. Myers. After a few more hours of fruitless searching I left the most reliable location and explored a bit. Sometime around 10:35am I heard the bird calling at the far SW corner of the bike trail property and was able to "pish" it into the open for a few seconds, part ecstatic and part shocked that I was actually looking at this thing I had spent over 8 combined hours searching for. The bird dipped back into the shadows but continued to call, a short, high and thin 'seet' which I recorded with my iPhone and have uploaded HERE. The bird also gave two longer, descending 'seeeeerrrr' calls, but I did not get those on tape. The species Western Spindalis (Spindalis zena) is comprised of five subspecies that reside on various West Indian islands, though further study could conceivably lead to splitting (I am not aware of a comprehensive genetic study). 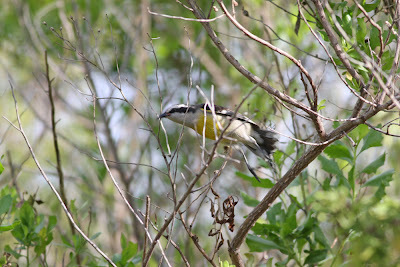 Males of at least two (probably three) subspecies have been recorded in Florida. The most common is S. z. zena (from northern and central Bahamas), followed by a few apparent S. z. townsendi (from Grand Bahama and Abaco), and one likely record of S. z. pretrei (Cuba). Males are often separated by back color, though it is reported that this character can vary in a particular subspecies. Since this bird is a female, its race is currently unknown. As far as I know, field separation of female zena versus townsendi cannot be done with confidence given current knowledge. But perhaps this will be worked out in the future, and voice study could always prove to be significant. If so, the recording could come in handy someday. Jan 10 - Florida "West"